The term lifelong reader is more than a slogan or jargon in a mission statement. Lifelong readers need passion, agency and instruction – and they also need books! According to the American Library Association, classroom libraries (alongside well-stocked school libraries) should include about 300 titles. Fountas and Pinnell recommend that each classroom library has between 300-600 titles. Kelly Gallagher writes in his ground-breaking book, Readicide, “If we are to have any chance of developing a reading habit in our students, they must be immersed in a K¬-12 ‘book flood.’ ” Developing lifelong reading begins with books and we, as educators, have the power to make a school’s book supply seem endless in the eyes of its readers. 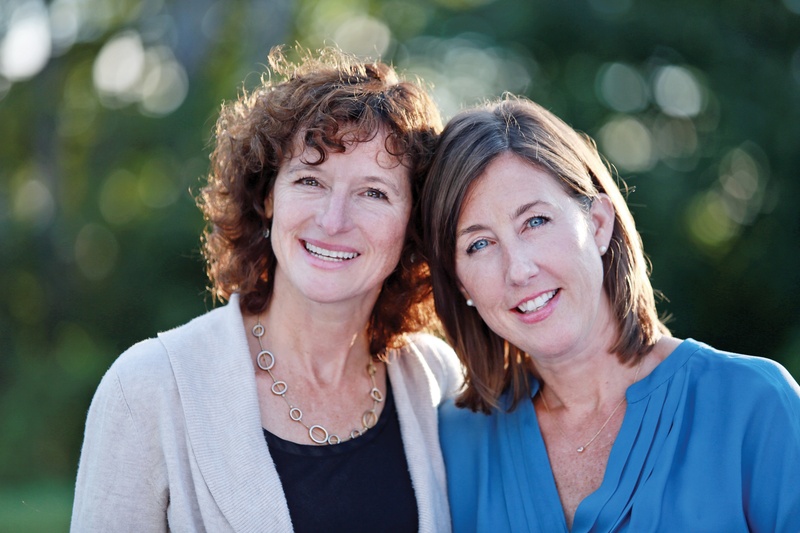 We have been partnering with school districts as literacy consultants for the past fifteen years. We find that 90 percent of the time, when a superintendent asks what he or she should do to get the desired academic results, we reply, “Fire us and buy some books.” We find again and again that teachers do not have the tools they need to bring the research on literacy best practices to life. The good news is, no one has ever fired us AND they find the money to get the books. We know it is that time of year when budgets are due. We believe books need to be a line item on every school budget. If we design curriculum and progress-monitor our students, but don’t have a wide variety of books for students to read, these initiatives will fail. Books matter – we cannot teach literacy without authentic literature in classroom libraries, bookrooms, and school libraries. We know budgets are tight, but the time is now for schools to prioritize the funding of purchasing books so all students have the opportunity to be lifelong readers. Don’t take our word for it! 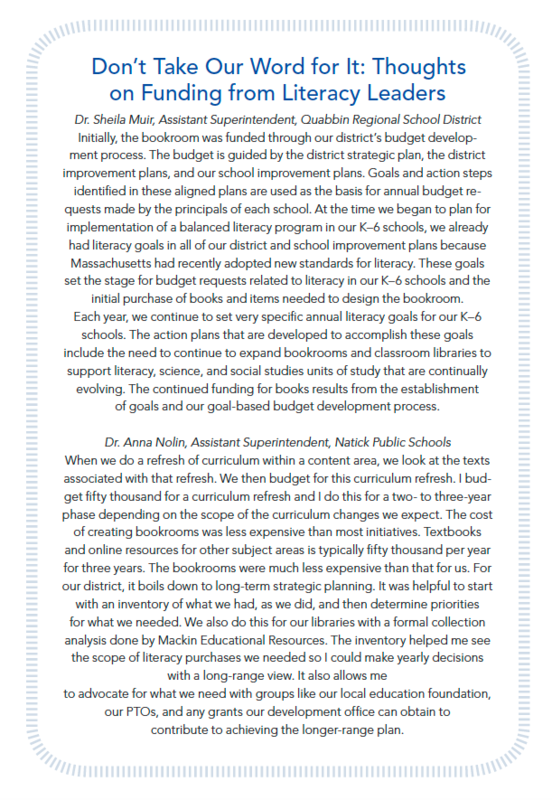 Here’s how two literacy leaders figured out how to make books a line item in their budget. We are often asked, “How much money does a school need for books?” We wish there was one answer, but of course there isn’t. It depends on the number of books you currently own, the condition and age of these books, and the number of students and teachers in the building. Each K-1 students reads approximately five to seven books per week. Each 2-3 student reads approximately two to three books per week. Each 4-6 student reads approximately one to two books per week. 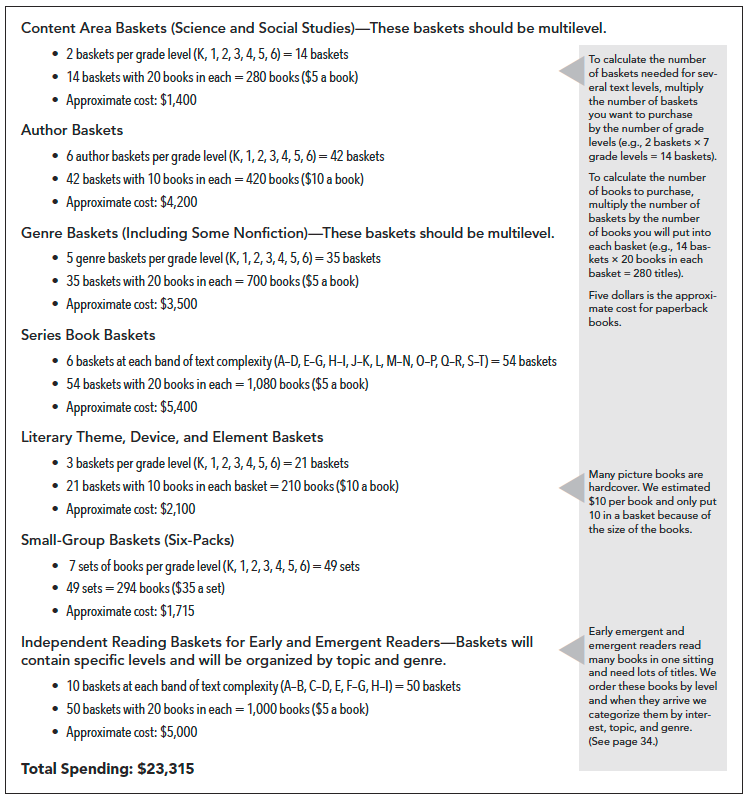 If the school year is thirty-five weeks long, you can estimate the number of books to purchase for each grade level. For example, if there are 80 students in kindergarten and first grade (4 classrooms) those students will read approximately 400 books a week (80 K/1 students x 5 books per week). If you multiply this number by thirty-five weeks in a school year it totals 14,000 books. Now, we can only dream of having that many titles! If you can afford this, go for it! But if you are like most of our partnership schools, your budget is tight. This is why we recommend teachers share texts across classrooms. Let’s look at how these numbers change when teachers share books. When you create shared book collections each class will need the number of books 5-7 students will read over the course of a year. In our example above that means that the kindergarteners and first graders need 700 books ( 20 K/1 students X 35 weeks = 700 books). Of course, these numbers are estimates but they can help you create a realistic budget. To calculate costs, we estimate $5.00 per paperback and $10.00 for each hardcover when we design a budget. To help you know what types of texts to purchase, (i.e. series, books for genre, author, and content area studies) we use the sample ordering guide (insert Figure 5.1 below) and create our own. Creating an ordering guide will help you categorize the budget across grade levels, by text complexity levels, and by type of text. You will notice on the sample ordering guide, that we purchase books to go into baskets. These baskets typically contain twenty individual titles of paperbacks or ten hardcopy books. Housing the books in baskets makes it easy for teachers to grab some baskets, add them to their classroom library, and then swap them for different baskets in a few weeks. Now, we can give this portion of the budget to our literacy specialist, school librarian, and K/1 kindergarten teachers so they can begin shopping. This is not a one-time deal. New books are published every year and readers want to read “hot off the press titles.” Keep a line item for books in your budget every year. This will help you replace missing books and revitalize your collection with new titles. Order as a collective group. If you want books in all classrooms, all teachers should be part of the process. Use meeting times to look through websites and catalogs to find the books your students will love. 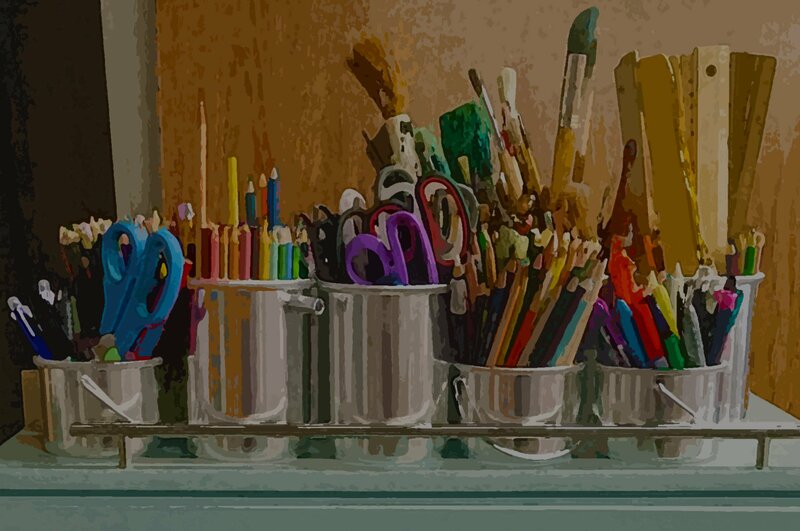 To make the shopping process a bit easier, we created lists of our favorite publishers, vendors, and catalogs as well as lists of tried and true series, and authors and illustrators organized by grade level. Check out the online resources 5.1, 5.3-5.6 in It’s All About the Books. Webinar: Join us on October 22, 29, and November 5 for a live webinar to talk about designing classroom libraries to support student choice and instructional goals. This webinar is interactive and we are looking forward to learning with administrators and educators across the globe. 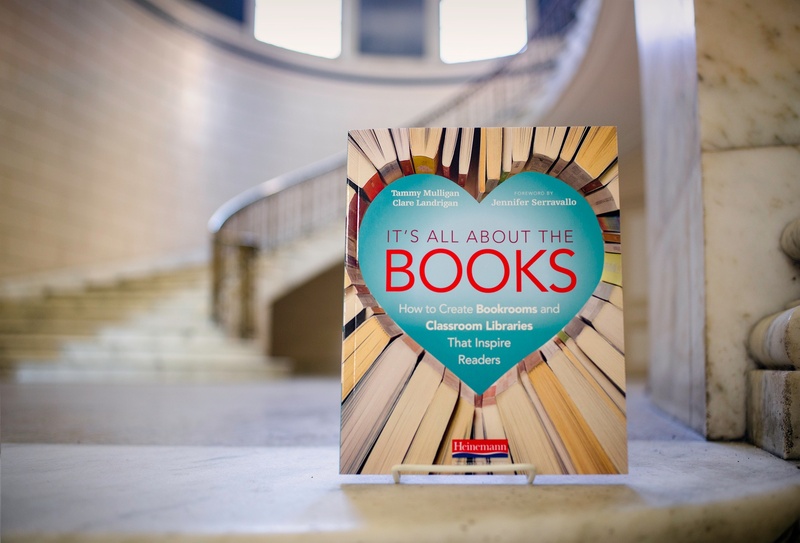 It’s All About the Books Facebook Group: Join the It’s All About the Books Facebook Group to see our latest thinking, connect with colleagues, and get the answers to your most pressing questions.